It is proposed to build an industrial enterprise called the 'Windy Hill wind farm'. The name is slightly misleading. This wind farm will not be along the Windy Hill Road but will straddle the uplands between Bishops Road on one side and Ballyhacket Lane and Burrenmore Road on the other. One of the site entrances will in fact be connected to the Bishops Road. As locals know, this road is one of the most scenic places in Ireland, so much so that even our government decided to make it an AONB - and area of outstanding natural beauty. The proposed wind turbines are of a new, extra large design and will measure from ground to top of the blade some 125 meters. This is not counting the height of the platform supporting it. Now, Benevenagh at its highest point measures 385 meters above sea level, but of course most of the uplands don't reach this lofty height. It takes little imagination to mentally visualise just how high these turbines would tower above the landscape and how dramatically they would interfere with a much-loved skyline. Below the letter I have written to the planners and some other relevant information. These documents contain maps of the proposed development, drawings of the turbines and letters written to the planners. Below is the text of a letter the editor of this site sent to the planning office. I am writing to object to the granting of planning permission to the proposed Windy Hill Wind Farm. I live on the southern slopes of Benevenagh and hence know and love the area well. The Bishops Road area and the imposing cliffs it straddles are an iconic and indeed historic landscape, the spoiling of which - by building any collection of wind turbines, never mind the huge structures proposed - seems to me to be an act of environmental vandalism beyond belief. 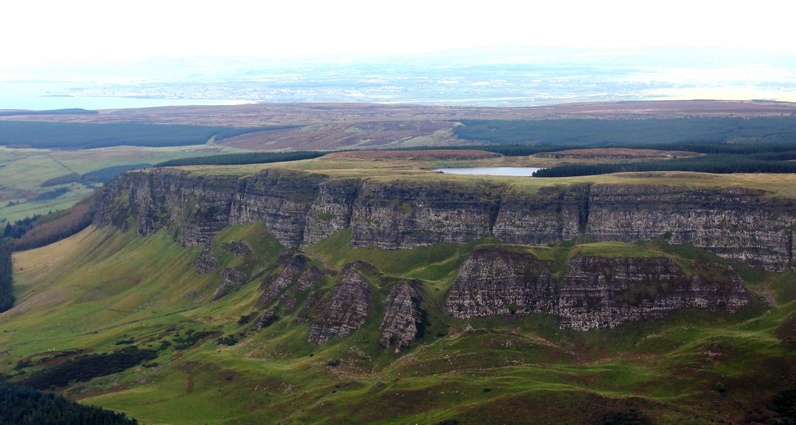 The cliffs and outline of Benevenagh are an area of rare and special beauty – in my opinion beyond compare in most of Ireland and even Europe. Through my website at http://roevalley.com I am in contact with many people around the world and I know that my views are shared not only by local people but by many living all over Britain and indeed the world. I accept that a (very weak) argument can be made for the erection of wind farms, but surely not in an area of outstanding natural beauty. These rotating giants have a way of catching the eye and holding it which interferes with the enjoyment of even the most stunning views, even when one tries to look the other way. Personally, I would be hesitant to drive my car along this rather narrow and winding road whilst my attention is constantly distracted by huge blades turning all around me. How the rather steep and narrow southern parts of the Bishops Road will cope with the massive construction traffic required is anyone's guess. I would also like to draw attention to the fact that this area is home to many wild birds – particularly birds of prey. I see several buzzards nearly every day - occasionally one can spot a peregrine falcon and I have even seen hen harriers several times. Many other hawks and owls can be spotted on a daily basis. Many of these birds would almost certainly be killed by the blades. It has been stated in the past that the risk of bird-strike is minimal, but recent research indicates that the frequency of bird-strike by wind turbines has been considerably underestimated. For all these reasons I would beg you most sincerely not to grant planning permission to such an unsuitable development.